According to a report by Anand Lal Shimpi of Anandtech, the performance gains Apple reported for the new A6 chip and other factors means that "it looks like Apple has integrated two ARM Cortex A15 cores on Samsung's 32nm LP HK+MG process." The site added, "This is a huge deal because it means Apple beat both TI and Samsung on bringing A15s to market." Previous generations of the Apple-designed chips used in iOS devices used ARM Cortex-A8 (the iPad / iPhone 4 A4) and Cortex-A9 (iPad 2 / iPhone 4S A5) processor cores. The Cortex-A15 is the next major jump for the ARM architecture, which calls the core "the highest-performance licensable processor the industry has ever seen." It would not be unusual for Apple to leapfrog the industry in commissioning an advanced new processor. In 2010 it debuted the then-new iPad with its A4, which used "FastCore" technology Apple acquired via Intrinsity to deliver a faster clocked implementation of ARM's standard Cortex-A8 core. "We have a chip called A4," Jobs announced when showing the new iPad. 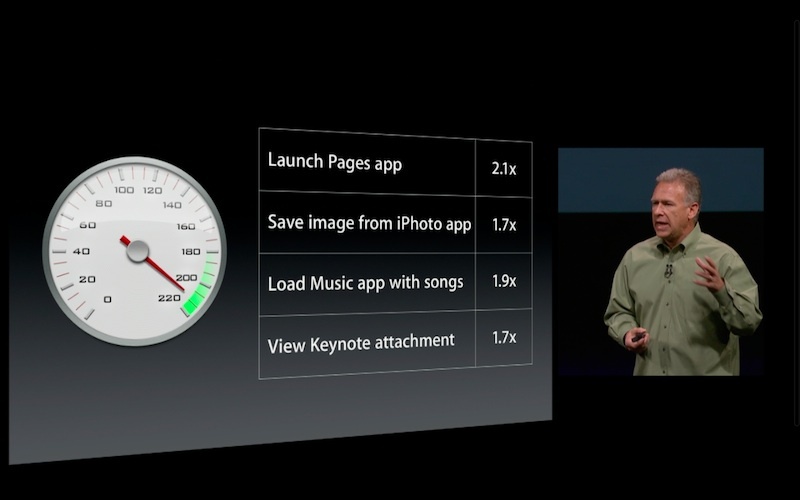 "which is our most advanced chip we've ever done that powers the iPad. It's got the processor, the graphics, the I/O, the memory controller —everything in this one chip, and it screams." The next year, Apple released iPad 2 with the new dual core A5, and Steve Jobs referred to it as the "first dual core tablet to ship in volume," a claim ridiculed by bloggers even thought it remained the only tablet to ship in any meaningful volumes throughout the rest of the year. RIM attempted to make "dual core" features a key aspect of its PlayBook tablet strategy, which was built upon a Texas Instruments OMAP 4 chip. Motorola also focused attention on its dual core Nvidia Tegra 2 chip powering the Android 3.0 Honeycomb Xoom tablet and its Atrix smartphone. By the end of last year, the tablet wars ended with Apple's iPad 2 unscathed. Rather than delivering an entirely new processor core for its next iPad, Apple gave it the A5X, a variant of the A5 equipped with quad core graphics and twice the RAM to power its new Retina Display with four times the pixels. 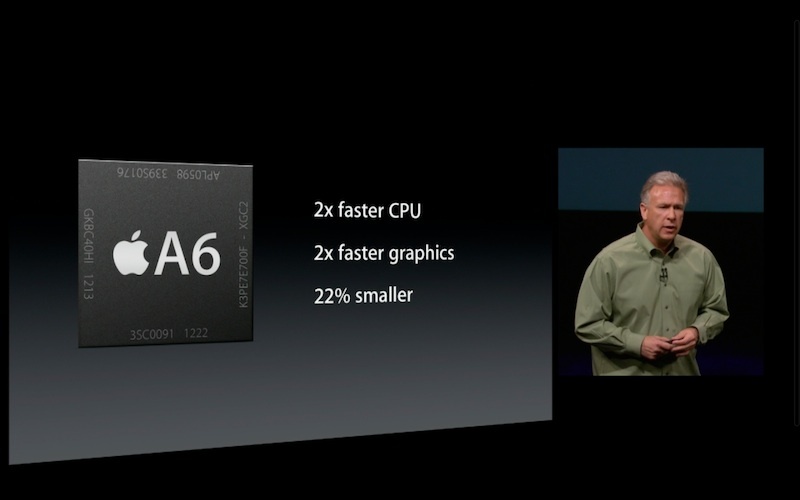 The A5X chip continued to use the same 45nm manufacturing process as earlier A4 and A5 chips. Apple custom Ax chips are fabricated by Samsung, which has historically produced a similar version of its own, albeit typically using different graphics cores and other variations. Samsung's Exynos 5 Dual pairs two ARM Cortex A15 cores with two ARM Mali GPU cores, while Apple's A6 likely uses the same quad core SGX543MP4 GPUs as the new iPad's A5X. If the new A6 uses Samsung's more advanced 32nm process, it would explain how the much faster chip retains an 8 hour battery lifespan while packing on faster processors and LTE support, as well as how it could possibly be 22 percent smaller than the A5 as Apple said during the keynote. In addition to Samsung's Exynos 5, TI's OMAP 5 series and Nvidia's Tegra 4 also use ARM Cortex-A15 cores. Broadcom and LG have also announced plans to license ARM's Cortex A15 cores. Qualcomm's S4 Snapdragon also implements a "Krait" architecture similar to the Cortex-A15.